The First Annihilation Fight Night Is On This Saturday Night!!! Have you got your tickets?! 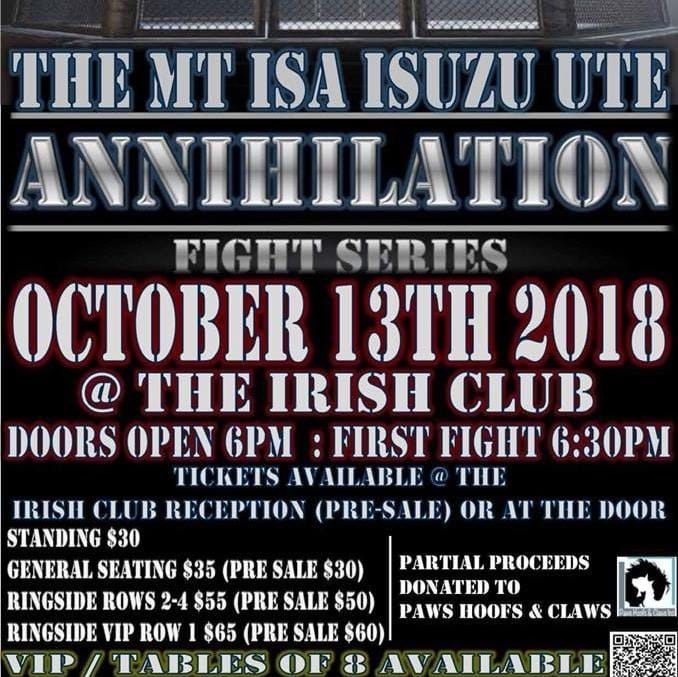 MAke sure you snap up your tickets because the Mt Isa Isuzu Ute Annihilation Fight Series is on this Saturday, October 13 at The Irish Club from 6pm! This is a locally-run fight night for local and out of town fighters, raising money for Paws Hoofs & Claws. The night will feature all disciplines and styles of fighting. Tickets are on sale now and can be pre-purchased at The Irish Club reception. Alternatively, they'll be sold at the door on the night. There will be heaps of entertainment and fun for all to enjoy!